Get your key to adventure and over 100 attractions and offers at over 60 partners in Carinthia. Enjoy the summits of the Nockberge-Turrach region at 5.300 feet above sea-level! Whether equipped with hiking shoes or skis, sports-loving and demanding athletes meet here for wellness and nature experiences. Enjoy a good night´s sleep in a pine bed, drink coffee at the panoramic fireplace and chat carefree on the sun terrace – put all everyday hustle and bustle behind you at the JUFA Hotel Nockberge – Almerlebnis***; after all, marked hiking trails, as well as ski and toboggan runs, are right in front of the door! By the way, you are welcome to bring along your four-legged friend – the facilities and staff are absolutely dog-friendly. The regional gastronomy inspires hiking and winter sports fans before carrying on in the evening with a convivial match of table tennis, billiards or table football. For the younger children, the timber-wood playground with a rope course and basket swing, as well as the marbles-playroom, are real highlights. If you occasionally don´t feel like hiking or skiing, you can opt for exciting excursions: For example, Castle Albeck, or discover the “Kingdom of the Forest Spirit King” and at the same time, scent aromatic pine forest air or take a horse-ride at the Riding-Eldorado. During the winter, the Hochrindl becomes a family ski resort and then, cross-country fans call the white mountain paradise the “Cross-Country Skiing Mecca”. The Carinthian Huettengaudi (hut-fun) is part of the winter holiday and brings the day to a cheerful end. Replenish your energy in the hut sauna, look after your inner health at the Grand water fountain and have a cosy chat in a pine cabin – wellness comes almost automatically at this JUFA Hotel! It´s not without a good reason that the three thematic areas “s G’fühl(feeling) – Wos tuan(activity) – s Ess`n(food)“ essentially stand for well-being in nature, sports fun and regional dishes. The Nockberge-Turrach heights and the JUFA Hotel Nockberge – Almerlebnis*** offer everything in one – during the winter, as well as in the summer! The JUFA Hotel Nockberge – Almerlebnis*** is located in the peaceful Hochrindl mountain pass. It is a perfect base from which to embark on infinite adventures and can be reached easily by car. Guests can make use of the free parking spaces for cars and buses. Travelling from Graz: Starting on the A2 travelling towards the south west – from the Klagenfurt-Nord exit travel on the S37 towards the B95/Feldkirchen/St.Vet – turn right onto the Friesache main road/Klagenfurt expressway/S37 – take the first right hand turning onto Turracher Strasse – turn right onto Gurktal Strasse – turn left onto Hochrindl Landstrasse – continue on to Sirnitz – turn left, remaining on the Hochrindl Landstrasse – travel straight on onto Hochrindl-Tatermann – turn right into Hochrindl – turn left, the JUFA Hotel is located on the right hand side. Travelling from Salzburg: Starting on the A1 travelling towards the south west – keep right onto the E55 – continue onto the A10 – merge onto 104-St.Michael im Lungau in Murtal Strasse at the exit – turn right, remaining on Murtalstrasse – turn left onto the B96/B99 – turn right onto the B96 – turn right onto Schattseitenweg/Turracher Strasse – turn right at the fork in the road, turn left at the next fork onto Reichenau – turn left onto Schuß – continue on the L65 – keep left at the fork – turn left twice onto Hochrindl – the JUFA Hotel is located on the right hand side. Travel without stress! 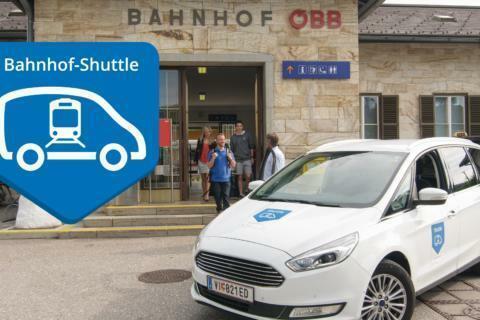 The station shuttle (“Bahnhof-Shuttle”) takes you directly to your hotel or to one of the numerous top attractions in Carinthia. The Kärnten Card is your key to adventure, fun and lots of advantages. It is a door opener to over 100 attractions and offers great discount at over 60 partners in the region of Carinthia. A hidden summer paradise for visitors seeking peace and relaxation. Lake Goggausee. The water temperature reaches up to 25°C which makes it a veritable jewel of the region. The high water quality makes it even more attractive for people of all ages. The lake is located in a landscape conservation area in the heart of the Wimitzer Mountains. Connect with your body, find inner balance and allow yourself to relax. Gather new energy to fortify you in your daily life. The “Take Time to Reflect” hiking trail creates new perspectives to apply to daily life, helps you to re-energise and connect with your true self. The starting point is the municipal office (Gemeindeamt), then go up Hochrindlstrasse a little further and turn right after approx. 100 metres. Along the Rammel stream, you will find a number of stopping points that encourage quiet inner reflection. In this charming fairytale park you can listen to tales about the forest and its inhabitants being told by characters such as “the noble spirit of the pines”, the wily fox and the water spirit. Children and adults alike will enjoy exploring this fairytale trail with its wooden figures, adventure playgrounds and glorious views over the beautiful Carinthian landscape. The JUFA Hotel Nockberge – Almerlebnis*** is not only a popular holiday destination, but also provides an expert service for businesses wishing to hold seminars, training events, team meetings or workshops that are run over several days. You will be able to make use of our modern on-site seminar and meeting room, which is equipped with the latest technology. You will find that not only our modern facilities will make your event more productive, but the variety of indoor and outdoor activities available at the JUFA Hotel Nockberge – Almerlebnis*** will also enable you to recharge your batteries. We will be more than happy to help you with the organisation and implementation of your plans. Please contact the JUFA hotel directly for further information. Our team will be happy to provide you with all the information you need! Sports clubs and school parties are all catered for. The locations of JUFA Hotels have been selected to provide plenty of opportunities for challenging sporting activities and are a perfect base from which to embark on a range of sporting adventures. Are you hoping to spend a week long sports holiday in the Nockberge Mountains? Would you like to work up a really good sweat on your hiking holiday, family holiday or skiing holiday? The JUFA Hotel Nockberge – Almerlebnis*** has first-rate facilities, including a small sports hall, e-bike rental on the Hiasl-Alm and the Nockholz playground with activity trail. There is a wide range of outdoor sporting activities available thanks to the hotel’s convenient location close to the ski slopes and toboggan run. Whether you are on a skiing holiday, mountain biking or hiking, you will be able to reward your sporting exertions with hearty home cooked meals and drift off to sleep in a completely relaxed state in a comfortable pine bed. The JUFA Hotel Nockberge – Almerlebnis*** guarantees that you will keep fit even on your holiday. For more information, please contact the JUFA Hotel Nockberge – Almerlebnis*** directly. Our team will be more than happy to provide you with all the information you need! "Sehr empfehlenswert für Schifahrer und Wanderer "
"Perfekt für 6-köpfige Familie mit Hund"
"Immer wieder gerne kommt man in diese JUFA zurück"
"Jederzeit wieder! Sehr zu empfehlen"
"4 Familien, 3 Nächste und alle waren begeistert"
The hotel manager Mario Schuschel and his team are available to answer your questions at any time! 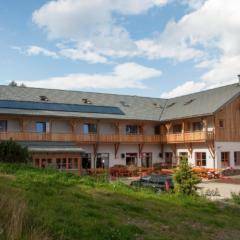 Im interested in the offer "JUFA Hotel Nockberge – Almerlebnis***" in the .